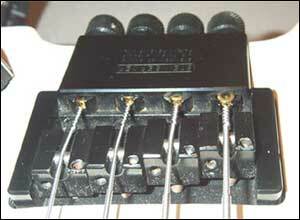 Ned's revolutionary design needed a revolutionary tuning bridge. The basic 4 string bridge was obviously offered during the entire production run. Early Brooklyn prototype L2 4 string bridge. Note the ball ends load through the top plate. The first L's have a two piece bridge whereby the saddle assembly and tuners were physically separate but sat right next to each other on the bass. 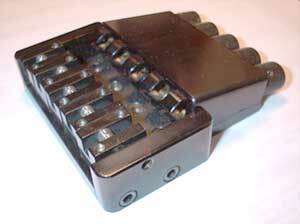 These bridges were milled in-house by Steinberger out of steel and featured the revolutionary tuning bridge with block style saddles. These first generation bridges are now referred to as the 4 string version 1.0 or simply v1. The 3 screws on the top plate are a distinct feature. When the XL's were introduced to replace the L's, a new v2 one-piece bridge was designed. 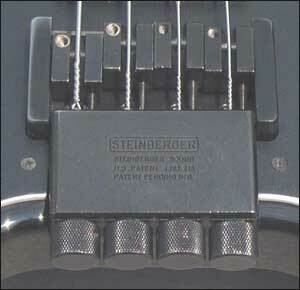 These also were made at the Steinberger factory. 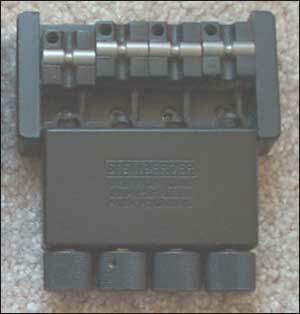 They featured one-piece saddle blocks but intonation was now made by adjusting a set screw at the front of the saddle which in turn is attached to the bridge housing. This allows for precise, stable intonation changes. XP2 bass with v2 Newburgh made bridge. Note the one piece saddles. One of the main complaints about the v2 bridges is that the one-piece steel saddle wears over time. After prolonged use and tuning the strings can wear a groove into the saddle. This messes with the intonation, and can often cause string breakage when tuning - the outer wraps of the strings get caught on the sharp edges of the groove and the core snaps under the tension. NOTE - To prevent this you can take a small file and round off the worn groove edges. This will keep you from breaking strings while tuning. With this knowledge Ned redesigned the bridge again in the mid 80's. 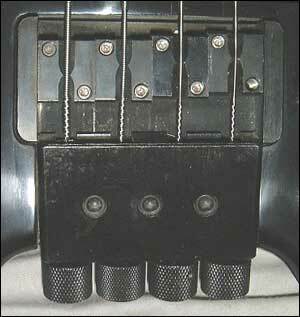 At this time Steinberger production was exploding and they contracted the bridge manufacturing to Schaller Germany. These v3 bridges are still milled steel, but feature a saddle block with a channel cut in them. A stainless steel post with a slight groove to guide the string is inserted about 3/4 of the way up through the side. The stainless rod/post does not show through the tops of the saddles. Of all the bridges made these were likely in production the shortest time. White XL2A bass with v3 Schaller made bridge. Note the stainless inserts inside the saddles. As Steinberger grew and continued to farm out machining operations they entered into an agreement with Zen-On, a Japanese company, to produce their guitar tremolos. 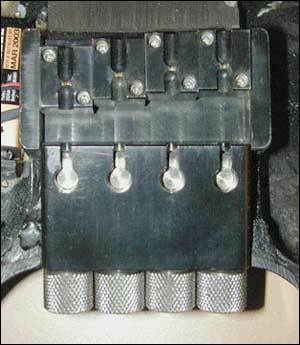 Steinberger also decided to use them for their bass bridges as well, and the v4 bridge was designed. Note prominence of stainless string inserts and string grooves. This latest version of the 4 string bass bridge has similarities to both v2 & v3. The basic shape and design is identical to v2, but the use of stainless steel inserts like in v3 is retained. These inserts differ from the Schaller/v3 variety in that a solid (rather than a channeled) saddle block is used with a larger diameter brushed stainless rod inserted into the side but protruding through through the top as well. A very noticeable U groove is milled into the rod as well. Notably some of the components on the v4 are not milled steel either. Rather they are hot forged from a zinc based alloy named "zamac". Not known for great musical qualities (it's used because it has a low melting point), some think these Zen-On made bridges kill a bit of tone and sustain. We've found the addition of the stainless inserts counteracts much of this potential deadness. NOTE - Some people think that the v4 stainless insert is actually a roller saddle. This is not the case. The rod is tightly inserted and does not move when the strings are tuned. From left: v2 Newburgh 4 string, Schaller made 5 narrow, v4 Zen-On 4 string. Shortly after the introduction of the guitar TransTrem in 1986, Ned went to work on a bass version of this revolutionary bridge. Introduced in early '87 and logically dubbed the "Bass TransTrem" it featured the same ability to transpose strings in tune from low B up to high C. These bridges were actually made by HAZ Labs. Not known as a machine shop, this was done as a favor to Ned from Henry Zajic (HAZ Labs founder & owner). Bass TransTrem featured on a white XL2TA bass (trem arm not pictured). Though inspired, demand and interest in the bass version of this tremolo was never very great. Outside of the initial production run, no more were ever made. Best accounts are anywhere between 140 and 200 bass TT's were produced. HAZ Labs recalls it being 2 runs of 100, but actual documentation is non-existent. Steinberger offered the bass TT as an option into the '90's until all existing inventory was gone. Though our TransTrem instruction pages are focused on guitars, the same principles of installation, setup and use apply to the bass version as well. Click here for helpful tips on setup and use. Bowing to the lack of consumer interest in the bass TT, Ned realized that most bassists don't necessarily want to transpose all the strings on a 4 string bass; they primarily want to tune down a little. In 1988 the DB Tuner was born. Officially referred to as the "DB Bridge System" it has all of the same features of the standard 4 string bridge (tuners, saddles, etc.) but adds one feature to the E string - a detuning lever. With a flip of this lever you can instantly lower the tuning from Eb down to low B. A fine tuner allows this detuned note to be precisely set. DB bridge on a newer XQ2 bass. Note the stainless inserts in DBv2 saddles. 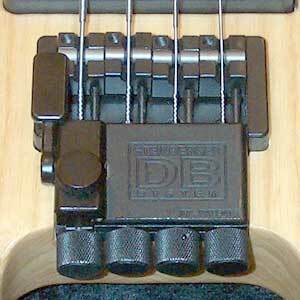 There were two versions of the DB bridge: the first (DBv1) with one-piece saddles (like on the v2 4 string bridge), and a second Zen-On made one with the 4 string v4 type stainless insert saddles (DBv2). Like the narrow 5's these were designed with the same universal 4 string bridge footprint, and can be/were easily interchanged with other bridges. From the beginning Ned realized that the strength and rigidity of his graphite neck would allow much more tension on it without bending - much more so than a traditional wood neck anyways. So in 1982 he introduced a narrow 5 string bridge. This bridge had the same footprint as a normal 4 string bridge but accommodated 5 strings (either low B or high C). Steinberger offered this on new basses (dubbed the L-2/5 at the time), but you could also pick up a 5 string narrow bridge and accompanying headpiece to swap on your existing bass. Schaller made 5 string narrow bridge. Notice the stainless saddle inserts and the sideways jaws. The L versions of these bridges were made in-house, while the XL versions appear to have been made by Schaller featuring the same 4 string v3 stainless saddle inserts. 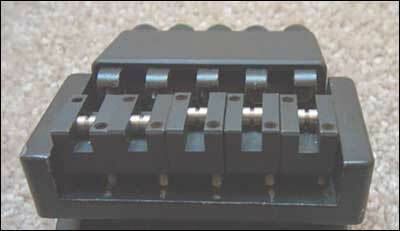 In actuality, Schaller re-milled standard 4 string bridge parts to use as 5 string narrows. Because some of the attachment screws on the base of the unit were in the way with the narrow spacing, new holes had to be drilled. If you turn one over you can see the original unused holes. Bottom of 5 narrow bridge. Note 3 unused holes towards the bottom. On standard 4 string bridges these are used to attach the bridge top plate to the base plate. It was not feasible to have the intonation screws attach to the bridge in such a small footprint, so the saddles in the narrow 5 must be attached manually (see full bridge pic above). Unlocking the side set screw release the saddles and you then set the intonation for each string by hand. It's also interesting to note that for some reason (unlike their 4 string counterparts) none of these bridges has the Steinberger name imprinted on the top plate of the bridge. 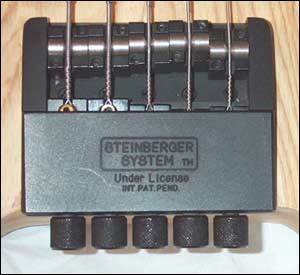 Because of this some folks think that they're not "official" Steinberger bridges. That's not the case. A slightly different version of the 5 string narrow bridge. 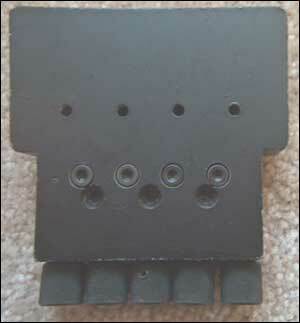 The sides are attached rather than part of the base. As for playability some love these narrow 5's. But many players (especially finger-style ones) complain that the string spacing is too narrow to adequately play. Keep in mind the 5 narrow bridge reduces the normal string spacing significantly, resulting in much more "cramped" space between the strings. But because of Ned's ingenious design 5 narrow bridges can usually be swapped with a 4 standard counterpart to fit a player's needs. With the introduction of the Q5 (XQ) bass in 1990, Steinberger offered a true 5 string bass for the first time. This bridge possessed all the general features of the 4 string bridge save one - saddle intonation is set by hand just like the narrow 5. Zen-On made version of the 5 string wide bass bridge. To differentiate these 5 string bridges from the narrow 5's, they are commonly referred to as "wide 5" bridges. These were featured on the Q5/XQ-25 basses and later on the XL-5W (wide 5 XL). 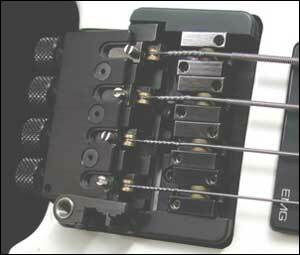 The original Newburgh made basses feature single-piece saddles blocks (5Wv1) while the later ones (5Wv2) have the Zen-On style stainless saddle inserts as seen above. It's interesting to note that every wide 5 bridge we've seen has the "Under License" tag you see on the bridge above. These are not aftermarket or clone bridges - they're the real thing. We don't know exactly why this wording is there. This special bridge was created by HAZ Labs in the final year of Gibson production (1998). HAZ built a single unit in an XQ bass to provide Gibson a "proof of concept" prototype. They modified the saddles on the bridge, inserted the piezo crystals, matched the buffers, and installed all of the electronics. It is not known if the prototype bass ever left the factory or if it still lives today. No circuit board was used in the prototype; all of the piezos and controls were hand wired. "It was a mess inside that cavity" comments Henry Zajic of HAZ. "If we would have taken it into production I would have designed a board for it, but didn't bother for just the one." Gibson ended up moth-balling Steinberger shortly thereafter so the idea was obviously never carried into production. But the idea didn't die. In recent years Stuart Spector bought back his namesake company and began making his own basses again. He designed a new bridge for his instruments that included the same block style saddles as the Steinberger. "Yeah, I basically copied Ned's design" Spector admitted. HAZ Labs provides all of the electronics for Spector basses, and when approached about a piezo option recalled their earlier Steinberger work. That same prototype design was modified to fit Spector and is offered on their basses today.